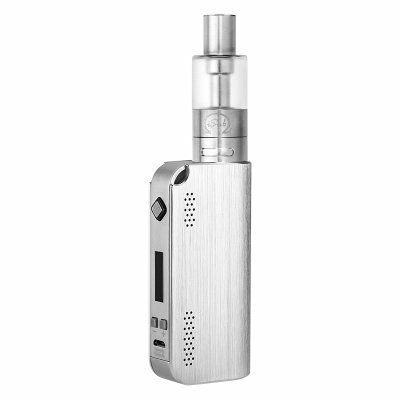 Successfully Added Innokin Cool Fire IV Vape Mod Kit - 40 Watt, 2000mAh Battery, Puff Counter, Short Circuit Protection, 0.2 - 3.1-Ohm (Silver) to your Shopping Cart. The Innokin Cool Fire IV vape mod kit is a state of the art electronic cigarette that features a wide range of adjustable settings, allowing you to customize your vaping sessions to your own, personal, liking. With its adjustable power output between 6 and 40 Wattage, this E-cigarette is the perfect vaporizer for both beginning and advanced vapers. Its durable, compact, and stylish design makes the Cool Fire IV vape mod not only comfortable to hold but also extremely portable. No matter where you’re headed next, thanks to its compact and lightweight design this electronic cigarette can be carried around wherever you go. Packing a long lasting 2000mAh battery that can be easily charged through USB, this E-cigarette lets you enjoy multiple of vaping sessions throughout the day without needing to worry about running out of juice. Additionally, the Innokin Cool Fire IV vape mod kit also features a sophisticated LED display that inter alia informs you about your current battery level – assuring that you’ll never run out of juice unexpectedly while enjoying a relaxing vape. Thanks to its overcharging protection, you can be assured that your E-cigarette will always be charged optimally without damaging your battery. Simply fill up your tank atomizer with plenty of your favorite tasting e-liquid and, thanks to its powerful battery, you’ll be all set to vape the day away without the need to recharge your electronic cigarette. Featuring a 510 thread, this vape mod can be easily customized and upgraded as it can be used with the majority of vaping accessories out there. Therefore, in case you ever wish to upgrade or replace the current tank or atomizer on your powerful Innokin Cool Fire IV 40 Watt vape mod there will be plenty of possibilities. Its simple design features only three buttons, making this vaporizer easy to use even for the beginning vapers out there. Added to that, this 40W vape mod kit comes with a puff counter, timer, short circuit protection, and 15-second cut off through which it is guaranteed to deliver a smooth and safe vaping experience. With its adjustable 0.2 – 3.1-Ohm resistance, this powerful 40 Watt vape mod kit allows you to customize your vape experience even further – allowing you to manually set the amount of taste and vapor produced during each hit. Besides providing a tasteful experience, the Innokin Cool Fire IV electronic cigarette is capable of producing extremely large vapor clouds – letting you not only impress your fellow vapers but all people passing by as well. Perfect for vapers of any level - this electronic cigarette is sure to meet the likings of everybody out there. The Innokin Cool Fire IV vape mod kit comes with a 12 months warranty, brought to you by the leader in electronic devices as well as wholesale electronic gadgets..
Arabic: - السجائر الإلكترونية - Chinese Simplified: - 电子香烟 - Czech: - Elektronická cigareta - Dutch: - Elektronische sigaret - French: - Cigarette électronique - German: - Elektronische Zigarette - Hebrew: - סיגריה אלקטרונית - Hindi: - इलेक्ट्रॉनिक सिगरेट - Hungarian: - Elektronikus cigaretta - Italian: - Sigaretta elettronica - Japanese: - 電子タバコ - Korean: - 전자 담배 - Malay: - Rokok Elektronik - Norwegian Bokmål: - Elektronisk sigarett - Romanian: - Tigara electronica - Russian: - Электронная сигарета - Spanish: - Cigarrillo electrónico - Thai: - บุหรี่อิเล็กทรอนิกส์ - Turkish: - Elektronik sigara - Vietnamese: - Thuốc lá điện tử.